WTH! What are you Chambar? When it comes to high-end cuisine, it features fabulous food paired with a relaxing and comfortable dining experience; both achieved by a staff that is attentive, efficient and organized. Every miscue by a restaurant moves them away from elite status. Chambar was the latest destination for my company’s staff dinner. Its food was wonderful but service and other missteps diminished our group’s experience at the restaurant. As a result, Chambar defies categorization; it doesn’t neatly fit into high end dinning but it’s not a middling restaurant either. The new Chambar space is beautifully appointed. Seated downstairs away from the pulsing music, my dinning companions and I decided to share as many things as possible. We started off with the Foie de canard “villa lorraine” and the Calamars Farcis. 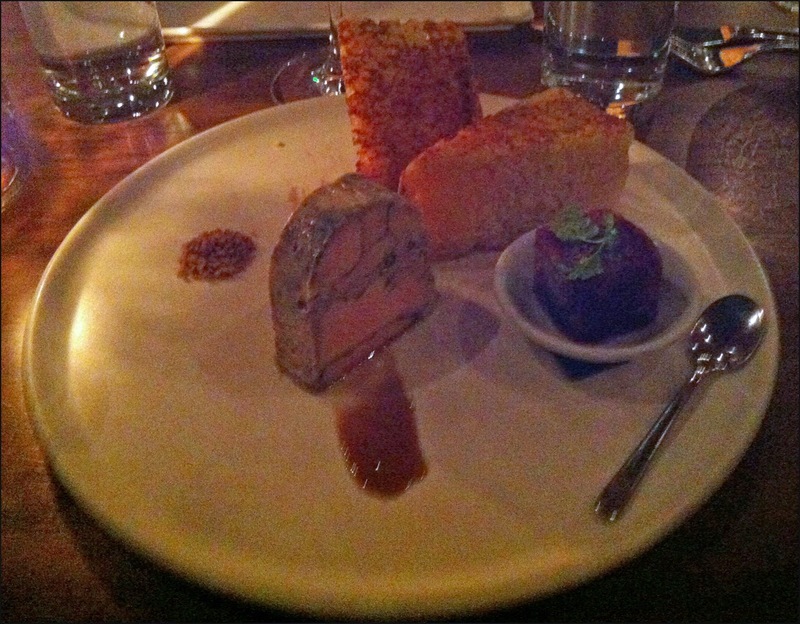 The foie gras terrine was excellent. All the elements of the plate added contrasting flavours and contributed to a balanced experience. The fois gras, as expected, was rich and delicious. A sweet port reduction made the fois gras seem less heavy. The brioche French toast acted as perfect vessel to eat the terrine. Finally the kriek (which is a style of Belgian beer made by fermenting lambic with sour Morello cherries) granita was the perfect icy tart palate cleanser to balance the creamy and decadent duck liver. Our second appetizer was a veal stuffed calamari served with potato chips and tagine aioli. The squid was cooked perfectly but I felt the veal stuffing’s texture was too coarse to work with the soft squid. Overall I felt this dish was less harmonious than the fois gras terrine. Each element seemed kind of random and didn’t seem related to one another. 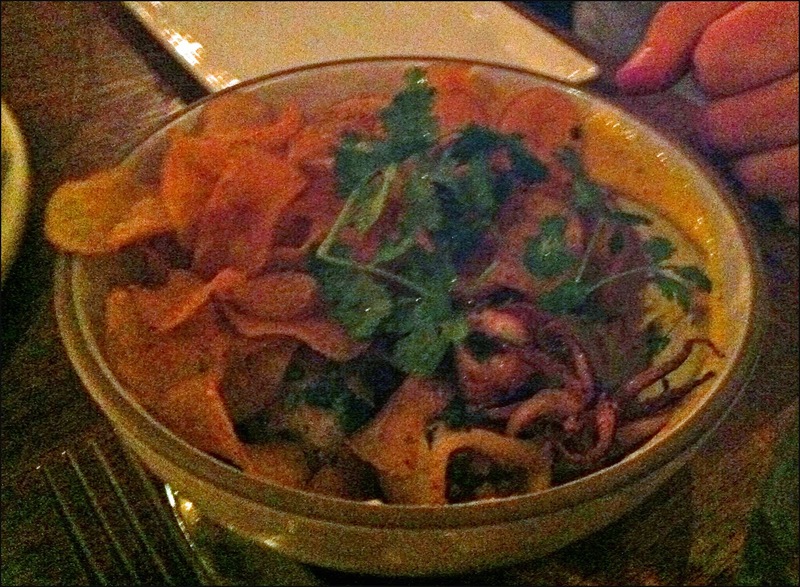 Essentially it was a bowl of chips with squid on the bottom. Since one of my dinning companions was on a diet, she opted just to have a salad as her entree, which I’m not talking about because it’s salad (you don’t win friends with salad). 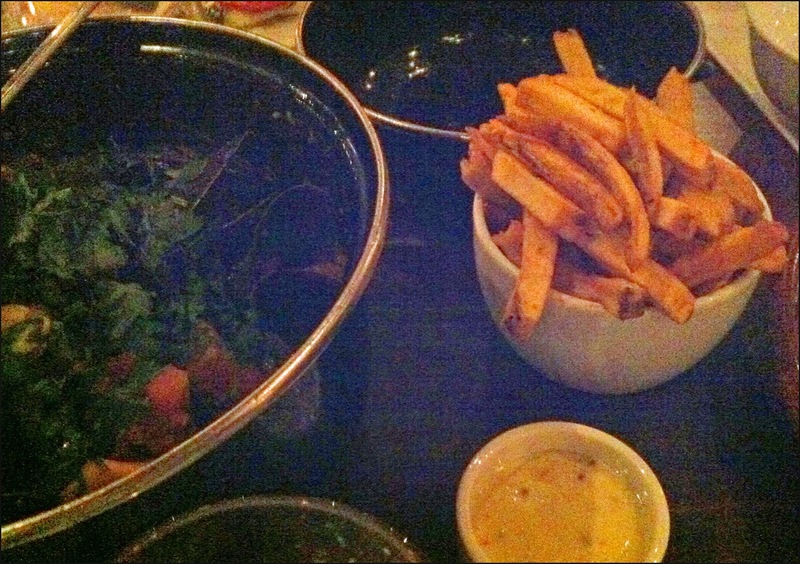 Congolaise Moules Frites and the Tajine d’aziz a l’agneau (aka the lamb tagine). Both dishes were complex, flavourful and surprisingly came in a very generous portion. The three of us were stuffed. The mussels were fresh, plump and perfectly cooked in aromatic and tangy tomato based broth. 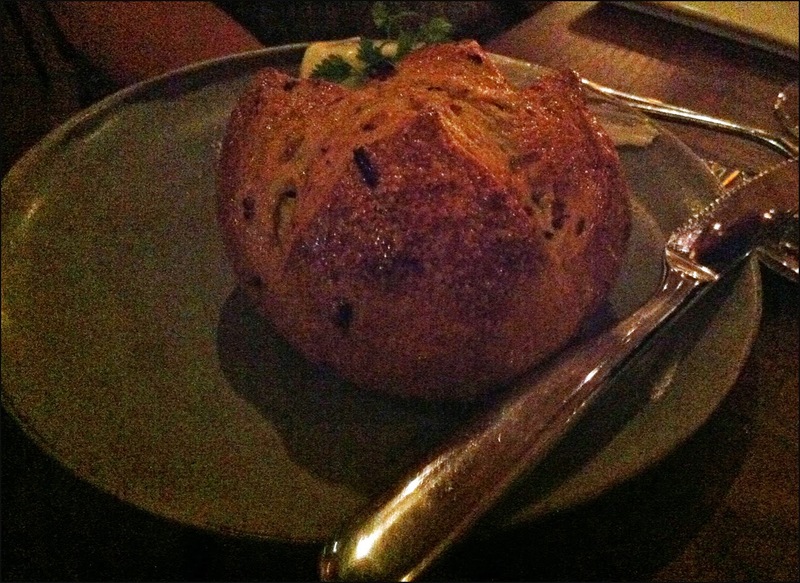 Fortunately we ordered the $8 freshly baked bread, which was great to soak up the umami rich liquid in the Moule Frites pot. I think the best part of the dish for me was the occasional burst of licorice brightness from the fennel seeds. 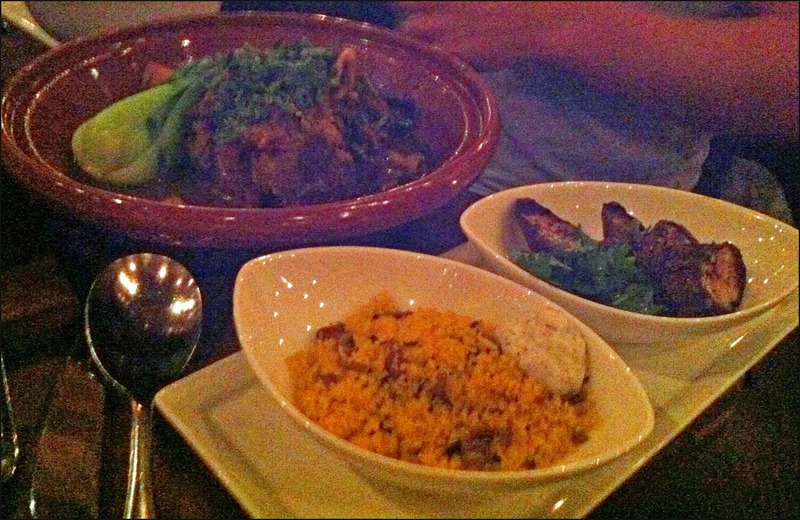 The braised lamb shank was fall off the bone tender. The lamb’s slight gamy taste was offset by the sweetness from the honey and figs in the dish. Once again the cooking liquid in the dish was fantastic. 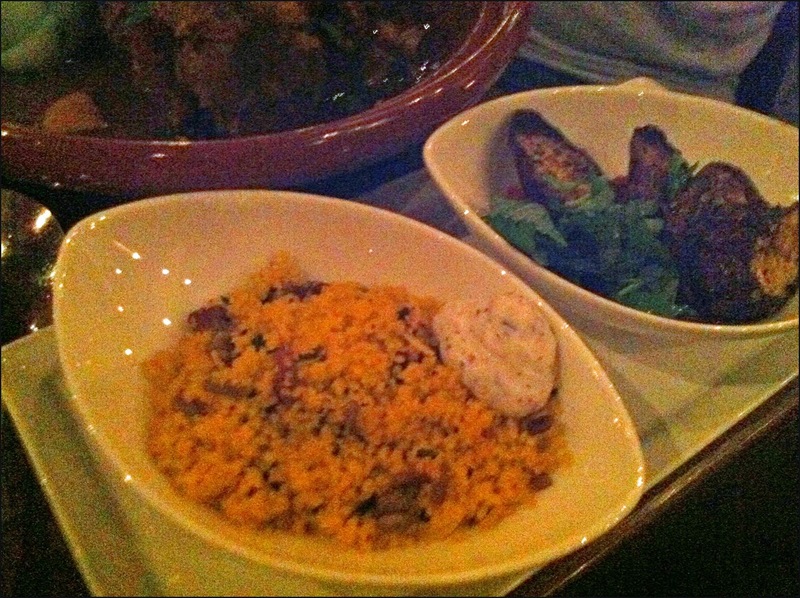 The cous cous and roasted eggplant that came with the dish were great at absorbing the juices that pooled in the tagine. To conclude our meal we order the éclat de chocolat and the seasonal la Citrouille for dessert. I think I preferred the éclat de chocolate which essentially mimicked the flavours of a tirumisu but came in a more modern free form structure than the traditional Italian dessert. 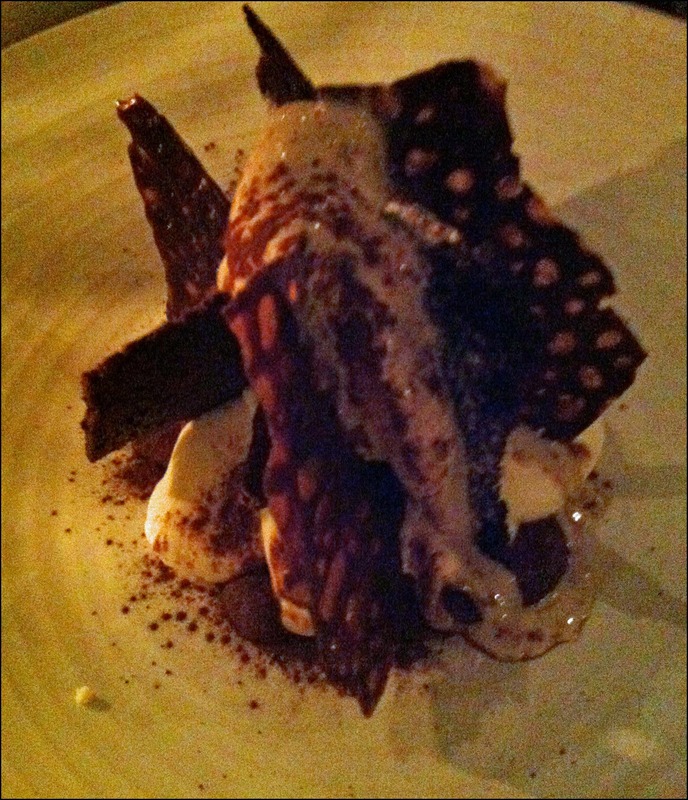 I liked the cocoa tuile which jutted out like sails. 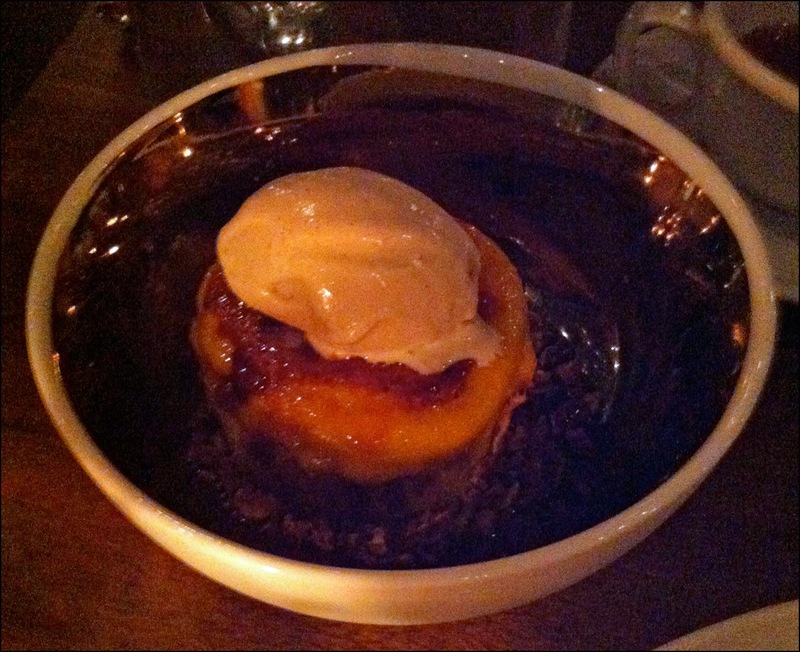 In comparison to the éclat, the la citrouille was just a plain cake with pumpkin cream and spiced ice cream. All the elements were well prepared but just didn’t have the same wow factor as our other chocolate dessert. 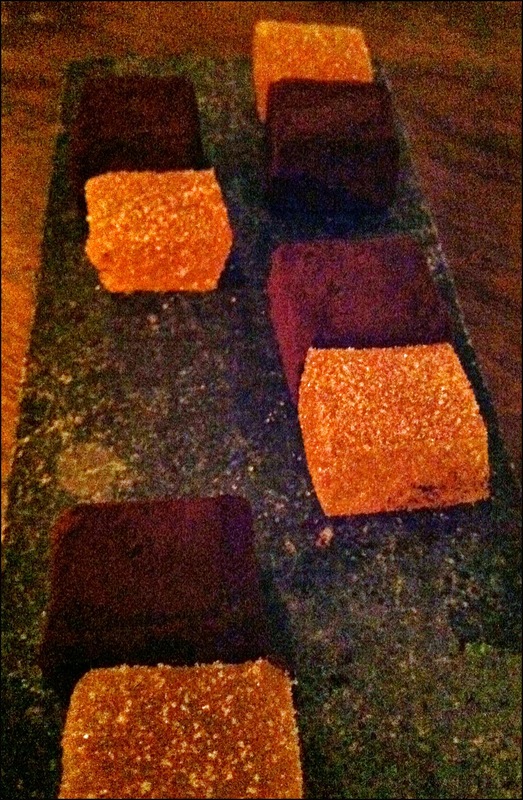 Just when we thought our meal was complete, the staff brought out a plate of rich and decadent spiced chocolate truffles and sweet palate cleansing orange jellies. A wonderful treat to cap off a night of fantastic food. Overall when the food is so enjoyable, like it was at Chamber, slight errors in service usually could be overlooked. Unfortunately the miscues were too glaring that night we were there. It started with our arrival. The greeting area was just a disorganized mass of people squeezed into a very narrow space. People were trying to check in, have their coats hung up, retrieve their coats and leave the restaurant all at the same time which lead to bumping, delays and confusion. With all the chaos and our reservation not being honored on time, the front area of Chambar actually reminded me of being at a popular dim sum place at noon on a Sunday. Secondly, despite only ordering 2 entrees and a salad, the table we were seated at was not spacious enough for us to leisurely enjoy our meal. The tabletop we were given was capable of handling a party of two and not a party of four. 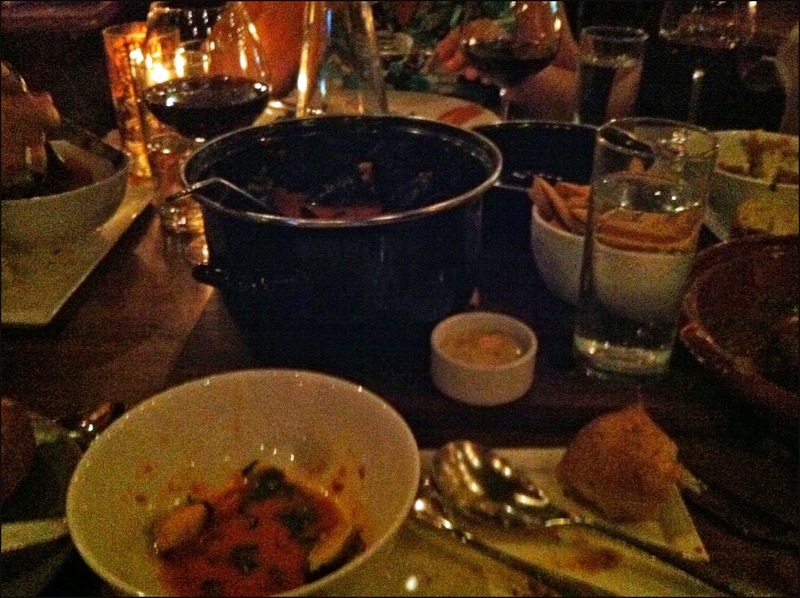 Our table was filled to capacity with our entrees, water glasses, wine glasses and share plates. 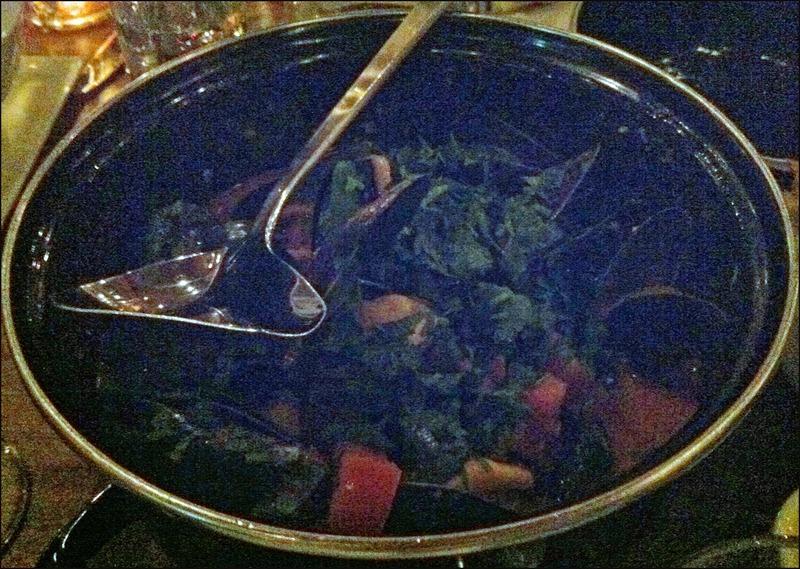 We basically had to eat our dinner like we had T-Rex arms to enjoys our mains. I felt that if we actually ate normally with our arms spread out we would have certainly knocked and spilled things all over our table. This probably lead to our third issue which was our wine was placed on a nearby ledge and not at our table. This would not be an issue if our server was attentive and made sure our wine glasses were filled but unfortunately this was not the case. As a result my boss had get up and walk over to the ledge to retrieve our wine more than once. This was just awkward. At one point my boss almost grab another table’s wine since more than one decanter of red wine was present. Normally these mistakes would be chalked to bad staff, but in this case I can honestly say that all the staff involved were doing the best they could considering how busy the restaurant was. Unfortunately I felt the design and layout of the new Chambar was working against the hostesses and servers, which created a lot of the service mishaps. In short, the food at Chambar is definitely high end but on the night we were there our overall dinning experience was not 5 stars. With that said, I would return to Chambar but I would make a reservation for my party plus a phantom person who happens not to show up that night to ensure we get a proper sized table for the night.